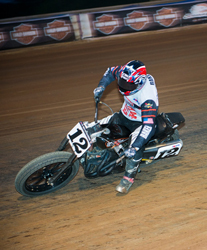 HAGERSTOWN, MD - Harley-Davidson® Screamin’ Eagle® Factory Team substitute rider Brad Baker finished seventh in his debut with the team in the AMA Pro Harley-Davidson Insurance Grand National Championship flat track event on the Hagerstown Speedway half-mile Saturday night. The race was won by Rogers Racing/Blue Springs Harley-Davidson rider Jared Mees, who also leads the series in points. Baker, who is riding temporarily while injured Harley-Davidson® Screamin’ Eagle® Factory Team rider Kenny Coolbeth recuperates from a broken leg, finished third in his heat race to advance to the main. Baker came around on the first lap of the main in 11th place, but got faster as the race progressed, posting his best time of the night on the 24th of 25 laps and passing Moroney’s Harley-Davidson rider Bryan Smith to gain seventh position on the last lap. “The Harley team did a great job working with me tonight to get the bike set up,” said Baker, who at 19 is in his second full season racing in the Expert Twins class. “I got a bad start when a rider came down and cut me off, and I had to check up. I spent a lot of time racing with Bryan Smith, which made it hard to get a good rhythm going. Once I got in clean air the bike was fast. Mees, the 2009 Grand National Twins champion and 2011 title runner-up, led 24 of 25 laps to earn his first win of the season. Mees passed Zanotti Racing/Schaeffer’s H-D rider Jake Johnson on lap two and then broke away from a pack that included Johnson, South East Harley-Davidson rider Sammy Halbert, Scott Powersports Kawasaki rider Johnny Lewis, and Jeffery Carver Jr. on the Kiesow Racing/Hall’s Cycles Harley-Davidson. Mees held a lead of more than three seconds by lap 16, with Johnson opening a 1.3-second gap over Lewis and Carver, who were racing together. The race for third place came down to lap 22, when Carver got by Lewis and then held on in the closing laps to take the last step on the podium by 0.335 seconds. Halbert finished fifth, followed by Doug Lawrence on the R and J Racing Harley-Davidson, and Baker in seventh place. Earlier in the evening, Johnson won the four-lap Dash for Cash sprint bonus race. After six of 16 AMA Grand National events, Mees leads the series with 121 points, followed by Johnson with 106 points, Lewis with 97, and Halbert in fourth with 94 points. Baker is in eighth place with 59 points. The next race on the Grand National schedule is July 28 on the Sacramento Mile at the Cal Expo Fair in Sacramento, Calif.